Globally accepted by all engineering sectors for its unique shock absorbing and detuning properties, Resilient Couplings have earned the reputation of being ideal for drives where trouble-free operation is essential. We are offering Bamatec Spring Couplings which are compact with high torque transmission, it offers lower inertia. Higher speeds are also possible. In a short span of time, we have become one of the prominent Grid Spring suppliers, Resilient Coupling spring manufacturers, and exporters of India. Our manufactured Grid Spring Resilient Coupling includes a hardened grid spring that connects two hubs with the help of axially cut grooves around the peripheries of two hubs. This rotation - elastic transmission element consists of a spring assembly with 3 layers, with each layer comprising 3 single springs with square cross section. To furnish the varied requirements of our consumers in best possible way we are betrothed in offering an extensive range of Spring Coupling. We are involved in offering a spectacular array of Grid Spring Coupling to our esteemed clients at market leading prices. These products offer various advantages like easy installation, low maintenance and longer service life. Down time and breakdown time can be minimized in any manufacturing plant with the help of these grids or spring coupling in machines. These Grid Coupling are made from very high quality raw material which ensures hassle free work performance at its user end. These Grid Couplings are technologically advanced and confirm to industrial quality norms. The grid is free to rock, pivot and float within the hub teeth. 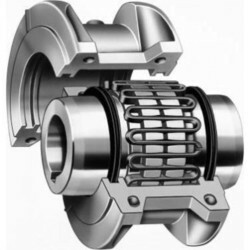 - High power rating of Gear Coupling & flexibility of Tyre Coupling. 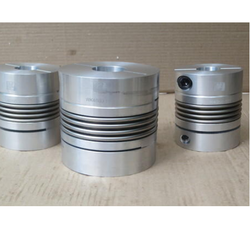 We are the leading supplier of Grid Spring Coupling.